Lashing out at Israel, Hamas promises its 'anger will explode' and that new details on IDF soldier Hadar Goldin will be released. A new clip published by Hamas on Wednesday night depicts terrorist fighters training for attacks against Israel inside terror tunnels. These underground tunnels, which connect Hamas-controlled Gaza to Israel's southern Gaza belt, have been preserved or rebuilt since Operation Protective Edge last summer. 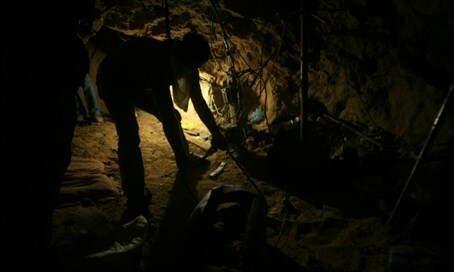 The terrorists of the so-called "tunnel unit" are seen practicing organized action, infiltration, attacking Israel military and civilian targets and evacuation of the wounded. In the carefully edited video, Hamas terrorists simulate firing at Israeli targets, taking over military posts and murdering an Israeli soldier at close range. Hamas also announced Wednesday that it will publish on Thursday "the secret" of IDF soldier Lt. Hadar Goldin, who was killed during Operation Protective Edge. Goldin was slain, along with two other IDF soldiers, during a Hamas ambush in Rafia and his body was subsequently abducted by Hamas terrorists. "Our message to the Zionist enemy is that the patience of our people in Gaza is running out and will not last long," members of the terror organization declared in a statement. "Our anger will explode in the face of Israelis like volcanoes." Early on Thursday morning, terrorists in Gaza fired a rocket into southern Israel. No injuries or damage were reported. In response, the Israel Air Force launched an airstrike against a weapons manufacturing site belonging to Hamas in central Gaza.